We’ve just had a succession of 40 degree days. I’m talking Celsius (that’s over 100 degrees Fahrenheit), and yes, I’m writing from the Southern Hemisphere – Australia. The cicadas have begun singing in the eucalypt forests around us, and the other morning I put my microphones out for a few hours to capture their choruses. For those of you locked in the depths of the northern winter, have a listen while you read on, it may warm your spirits! Now on to ‘I and the Bird’ #116 – the hot, the cool, the mysterious and the exotic! 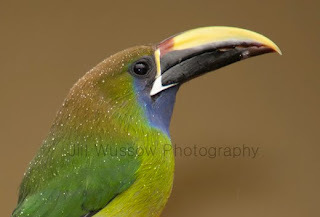 Lets stay in warm climes to begin, visiting Panama in search of elusive Ground Cuckoos, Ecuador for an emotional encounter with a Crimson-mantled Woodpecker, and a gallery of truly stunning images of birds from Costa Rica. While we’re in latin America, wade through the mud for a day with a research team studying Flamingos on a lake shore in the Bolivian high Andes. Off to Africa next, and a new quest; to sight one of Tanzania’s endemic skulkers, the secretive and rarely-seen Spot-throat. In Australia, we brave inclement weather hoping to hear the ethereal dawn song of the Tawny-crowned Honeyeater. Now let’s go way cool… For many of you, winter is bringing the challenges of birding on chilly days, but the promise of finding a winter wonderland of birds. 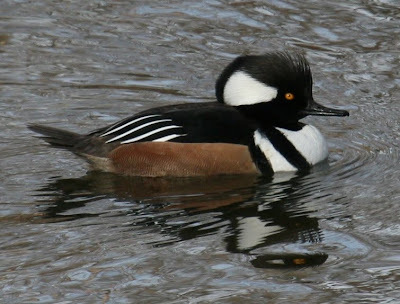 It is a good time to view waterbirds, and look out for seasonal visitors that have arrived to over-winter. Strolls by icy watersides give pleasure to many birders, bringing with them sightings of Gulls, waders and Mallards, both Red-winged and Brewer’ Blackbirds, plus Goldeneye, Eurasian Wigeons and, well, more Gulls!. In Denver, a short riverside walk leads to a collection of lovely waterbird images, and possibly a new addition to the birder’s lexicon; ‘Colatteral Duckage’. On the waters of New York Bay, gulls continue to fascinate with their graceful flight. 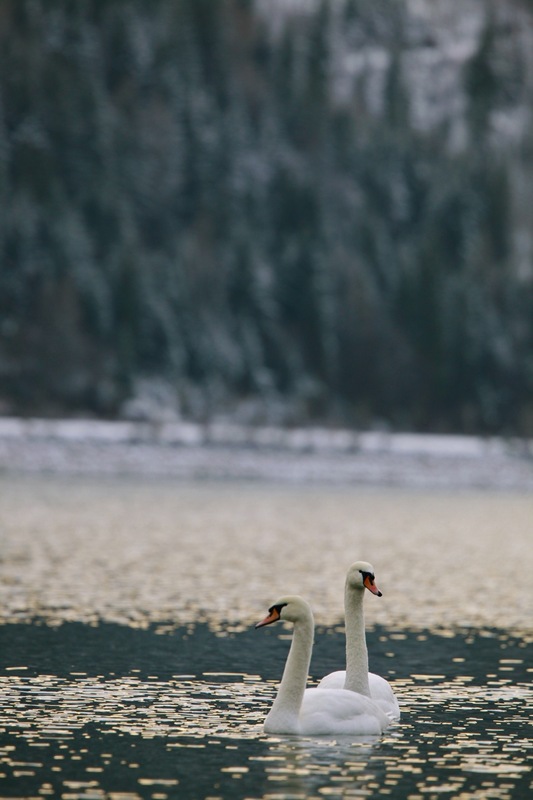 In Austria, Mute Swans float serenely on Achensee, prompting these thoughts on photographing white-plumaged birds in a winter landscape. Also out on the water, this Cormorant may have bitten off a little more than it can swallow! Of course one doesn’t need to venture far to enjoy the birdlife, even in winter. The bird feeder just outside is always a good place to view interesting behaviour and interspecies interaction – it also inspires an opportunity for bird sketching. As wonderful as photographs can be, a talented ornithological artist can capture something special of a bird’s character, as these studies of an American Bald Eagle show. Even using only monochrome pencil, an insightful artist can illuminate their subjects and bring them to life. Christmas bells were heard at the end of this day spent searching for raptors, and new year’s morning brought the first bird sightings of the new year. For another birder, a day spent Owling leads to a dilemma over the right thing to do. Winter also brings some unexpected encounters, such as this Brown-headed Nuthatch at Lake Norman. Here though is a sighting that is just plain baffling; the Desert Finch is a native of Kazakhstan – what is it doing in Arkansas? Which brings us to the mysterious. A flow-motion ‘mystery’ photo of a Golden-crowned Sparrow has now been conclusively identified, but is still fascinating for the abstract patterns created by moving plumage. On the subject of identifying species, consider this cautionary tale about being overconfident in your bird id, in this case a Turkey Vulture – especially when you didn’t actually see the bird! While with Turkey Vultures; here a group of them take over a cell-phone tower. Finally, to the exotic… and what could be more exotic than species previously unrecognised by science? This fascinating article presents a wrap up of newly-described species for 2009. May 2010 bring you many beautiful moments and delightful discoveries in nature. Good edition, look forward to clicking through all the links and checking out your blog in more detail. thank you for publishing this edition of IATB! it’s very nice and you obviously have devoted a fair a mount of time to putting it together. i do have one minor correction: the mystery bird was actually a golden-crowned sparrow! Ah yes, there is always something that escapes the proof reader, which, come to think of it, is actually me…. Wow! I just loved the bird songs! How relaxing. Now I’m going to have to decide which one to buy! LOL As a bird folk artist, my creations lean to the fanciful side, but there really isn’t anything more relaxing than watching and listening to the real thing. I was wondering though, the one sound in the sample above, the “thump” sound, like someone hitting a hollow log. Was that the toad? How lucky you are to live in such a wonderful place where exotic and beautiful birds live.